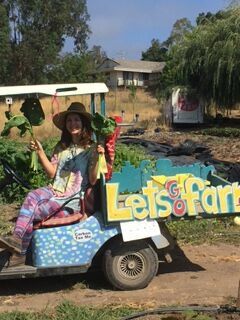 Let’s Go Farm is one of the many small farms that sustained heavy losses in the North Bay Fires. Can you give some background on your farm and property? Our property is 6.8 acres on Wallace Road in Santa Rosa near Riebli. As the crow flies, we’re not far from Safari West. Let’s Go takes up 1.5 acres. I started the farm in 2010, so this is the seventh growing season. I am a first-generation farmer. My mom and dad bought the property in 1977 and the house was built in 1983, the year I was born. I live there with my mom. What was the fire’s impact? All of the houses and other structures are gone. Basically everything was demolished. All the animals—six sheep and a pony—are safe, except for my bees. They were incinerated. I’m sad about my bees, but it could always have been worse. We lost our home, but we’re okay. We had to cancel our CSA. We had six more weeks. That’s 30 people times six weeks at $24 a box. I’ve offered my members a refund and most have said no. I had more markets to do. We were going to keep doing the Windsor Farmers’ Market until mid-December, so that’s a certain amount of dollars lost per week. I don’t grow year-round so I didn’t have a bunch of young plants in. We lost hundreds of dollars worth of boxes. A shipping container. There are all kinds of things that I haven’t quite itemized yet. To paint a picture, it’s the things you regularly see on small, diversified, row-crop farms. Hoop house, bee boxes, deer fencing. I need a walk-in fridge, a greenhouse, and seeds. Oh, and a golf cart. We’ll keep it going. Part of the reason I know that is the outpouring of support. 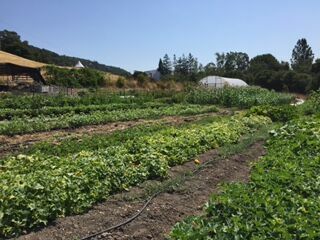 It’s never been clearer to me that small, ecological farms— whether organic or not—are a public good. I almost hesitate to say that because it might be taken as arrogance, but I truly believe that. The farm produces food, but it also produces positive experiences for people of all ages. If I had any doubt [about rebuilding the farm] in the first few days, it’s gone now. I think we can make it even better. You walk the land and ideas are always bouncing around in your head—we could do this or that someday. I want to do the things from before, and I want to do them better. That doesn’t mean I’m going to put up a fancy boutique thing. It means I want to shape the fence the right way, and put the hedgerows all the way around the field. I want to get the right varieties of fruit trees rather than the ones I got for free somewhere. And I want it to be just as open as before. I always invited people out to take photographs, pick flowers, and feed lettuce scraps to the sheep. The support has been an amazing reminder that what we’ve been doing all these years is good for me, good for my family and, I know in my bones, good for the community. 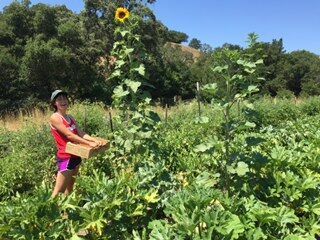 What can the Sonoma County community do to help you and your fellow small farmers recover from the fires? I would say, renew your commitment to buying locally—maybe in a way you’ve never thought of before. We could create a food system that’s fairer and healthier than it was before. And that’s going to take all of us. “Eating is an agricultural act,” as Wendell Berry said. That’s not a cliché to me. That was the idea behind Let’s Go Farm. Whatever you do, you’re involved in the food system. It might take the form of joining a CSA. It might take the form of buying 10 percent more at the farmers’ market. Those are concrete things. Everybody has been rocked. It doesn’t matter if your house is still standing or not. Do we go back to the same way it was? Are things automatically worse, or are they better? I want to make it better. People can make an effort to be involved in the conversation about the rebuilding of our area so it’s not dominated by the status quo. The more people that show up, the more representative it will be. We have a unique opportunity to reshape this area. The food system links into everything because everybody eats. Farmers can’t do all of the heavy lifting. Many hands make light work around this rebuild.